Sorry once again =__= I am FINALLY done almost all of my projects and studying so I should be able to post MUCh mroe often! Definitely!! Realistic. This does not really mean ‘totally real, everything in this show could really happen’ it is more of generalization of shows that take place in ‘our world’ using regular people who may or may not posses powers based off mythology or actual philosophy. In Jigoku Shoujo, for example, Enma Ai is based of the Japanese god of the underworld, Enma-O. The settings of these shows are familiar to us, even if the power of the characters is taken from another dimension or time plane-as long as most of the story takes place on Earth in the time position we are at, then it is a ‘realistic’ or familiar place to us. These are the shows that people are often captivated by, because they can picture themselves so much in that world, interacting with those characters and settings since they are not strange or ‘surreal’ to them. 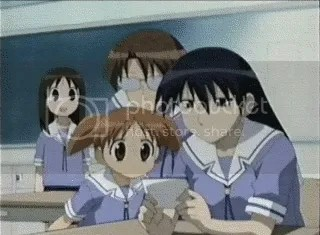 Some of the events in these shows, such as when we learn Haruhi can destroy entire dimensions whenever she got bored, are certainly not something that would happen everyday, but they are not difficult to believe in because of the realistic proof and through explanations provided with them. Okay, after an anime slump that I have been suffering for about the past week or so, I began watching it ravenously about two days ago. In that period of time I discovered and decided to begin two new anime shows. Here is the first. Shigofumi a new ‘horror’ series based around the world of the dead. What if those passed on could send letters to those still living? What if those dead could find final closure in retelling their true deaths and stories? All these things are made possible in Shigofumi. The animation of the show overall is pretty good, though not KyoAni quality. The characters are drawn consistently with pretty smooth and realistic body movements except only a few brief times. A fairly new show, Shigofumi just premiered in Japan exactly ten days ago from today (Premiered January 8, 2008) so there aren’t many episodes out yet, 6 to be exact – not all of the 6 episode titles listed yet have even been released yet I believe. The show is planned to run for 12 episodes and is based off the 2006 light novel. 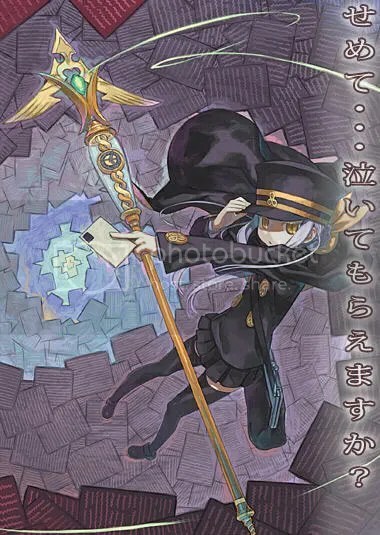 The story seems to revolve around a girl from the other world named Fumika and her ‘almost human’ staff Kanaka who deliver Shigofumi, or, letters from those passed on/ last letters. A young girl named Asuna who killed her father (which we find out later from reading his Shigofumi) and her friend Shouta get along well as friends, even though the only place they really meet is on the roof of an abandoned warehouse (Not what you are thinking =__=…) where Asuna spends time watching Shouta working on building his larger-than-life model rocket. After confessing to himself that he likes Asuna, Shouta attempts to tell her multiple times without success. 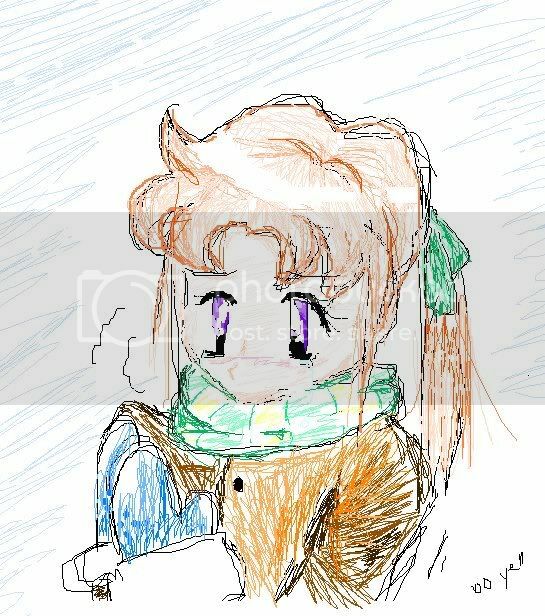 Soon after meeting Fumiko, Shouta finds Asuna’s father’s Shigofumi and reads it. Sheer disbelief flows over him as he reads that Asuna actually killed her father while Fumiko reassures him that ‘the dead cannot lie’. Of course, thinking the Shigofumi is some kind of sick joke, he runs to Asuna’s place in the night…scary things happen. 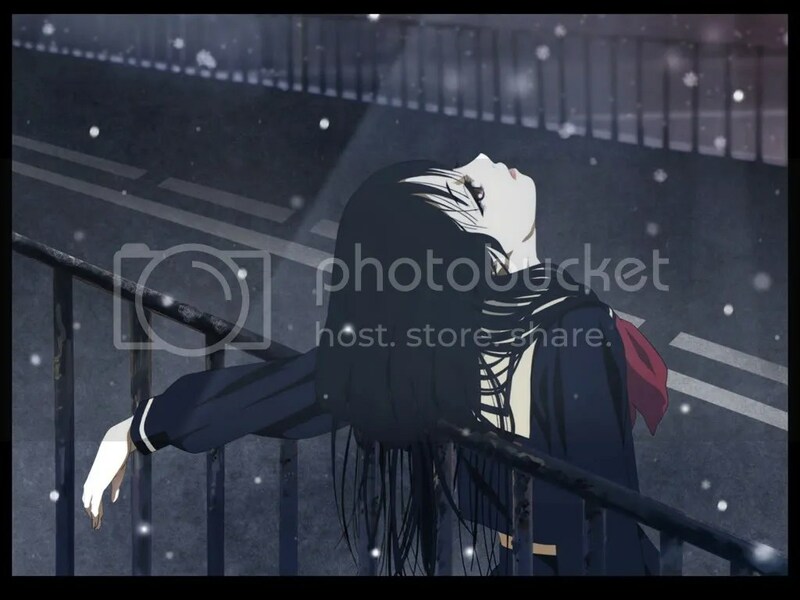 At a glance, one might compare it to Jigoku Shoujo. A young school-age girl doing the bidding of the dead, both carrying things to and from the world beyond to ours, but Shigofumi is actually very different. I would have preferred if they had left out the generic ‘talking staff/wand/inanimate object’ and made it more realistic like Jigoku Shoujo, but I give them credit for coming up with the general idea of letters from the dead. Personally, I don’t think they give enough information on the characters-the episode seemed a bit hollow. I couldn’t relate to the characters in any way so therefore the episode was over before anything could really sink in and it left me feeling a bit confused as to what I was supposed to be feeling. (If that made sense =3=) In general, the whole thing seemed very rushed. If they could have afforded it, a larger time slot would have been very, very good for series (24-26 episodes, perhaps). I guess it will be worth watching episode 2, but if that one doesn’t slow things down a bit or explain at least a little more, I think I may start getting annoyed with the series. The show can be seen on Japanese TV for now, and the first DVD is set for release in March 2008. 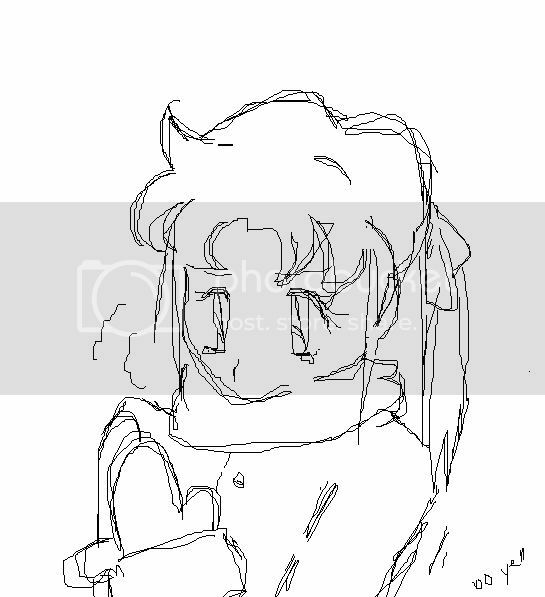 Forgive me for not being very active lately…..and when I actually do make a post I have nothing interesting to say @__@!!! Well, I will post more often and hopefully more interesting \(*O*)? Ah, Sola. My best guess is that the title is a take on the english word “solar” or an abbreviation for it. That title certainly fits the series in that sense. 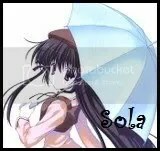 Sola was voted on of-if not the best- animes in Japan for 2007, though it sadly didn’t gain much of a reputation in other places. Sola is very much like the anime Air if you have seen it, very light and floaty and the whole series gives off an almost weightless feeling with the delicately drawn backgrounds and landscapes mixed with the scene upon scene of the sky. Though it is somewhat similar to other animes in terms of settings and themes, Sola is a one-of-a-kind unique show. Though I haven’t seen it to the end yet, it is already very intriguing to me and I definitely want to watch it though to the end. Relatively short, it is only 13 episodes long (though I personally prefer shorter shows because they aren’t long or drawn out, they are concise and to the point). The voice acting is wonderful (Mamiko Noto is the main role!!! *twitch* No wonder I like the acting…) and the animation is pretty good, though it’s not the best. The story revolves around a young boy who loves taking pictures, mainly of the sky “because it always changes” and a girl who is actually a very old ‘monster’ who can only come out at night and longs to see the day. The series is packed with strange, but beautiful and unique characters that really grow on you. The background music is also very fitting and it doesn’t distract you from the dialog but adds lots of ambiance to the show. I give Sola a 3.5 of 5 for a captivating plot line and good character development. FLCL is probably one of the best loved/most addicting straight-to-VHS animes out there. I seriously warn you though, you probably will not understand it while watching this show. Part of the magic of it is that, the answer comes to you long, long after… ((wow, did that sound creepy?)). It mainly follows the life of a middle-school boy who has a strange meeting with a random pink-haired, vespa-riding, guitar-slinging heroine. While watching the series, one may ask themselves, “Why am I watching this?” “Has humanity stooped so low as to make a show so random as this?” When they will be quickly distracted by a robot or two literally busting out from a boy’s head (not graphically or in a gory way, more in a comical ‘what the heck’ way) and they will be absorbed in watching it again. FLCL is one of those series that needs to be watched to be understood, and at only 6 episodes, it won’t take long so it’s easy to fit in between seasons or breaks in another series. The animation is really good for straight-to-video standards and the color palette used is rather flat, but in a good way that really adds a unique flair to the series. Be warned of random bursts of manga. is FLCL also recieves a 3 of 5 for total creativity and most unexpected plot turns….really unexpected. Parental Discretion Advised. Dark? yes. Horror? Maybe. Good Series? Definitely. This series is not exactly for someone who likes episodes that leave you on cliffhanger endings, happy endings, or pretty endings. Each episode is like it’s own little story, usually a tragedy of someone who is seeking revenge upon another. The Jigoku Shoujo’s–or Hell Girl’s–contract allows anyone to send someone else to hell immediately, as long as they have hate in their heart, though the price is that they, too, must go to hell when it is their time to die. 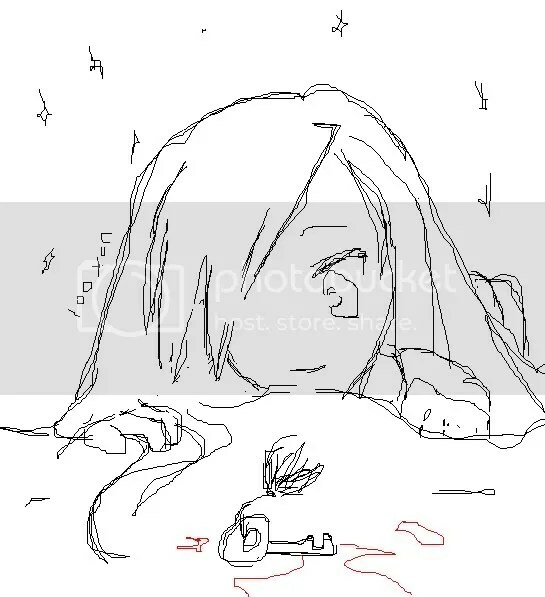 The story does not have specific recurring characters (except the Enma Ai who is the Jigoku Shoujo and her three servants) until the end when Ai’s story is finally revealed as a modern-day direct descendant of the one who betrayed her and his daughter unwillingly veiw a vision of her lonely childhood and brutal murder. One of my personal favorites, Jigoku Shoujo has 2 seasons with a third to be released at a specified date (First Season: Jigoku Shoujo — Second Season: Jigoku Shoujo Futakomori). 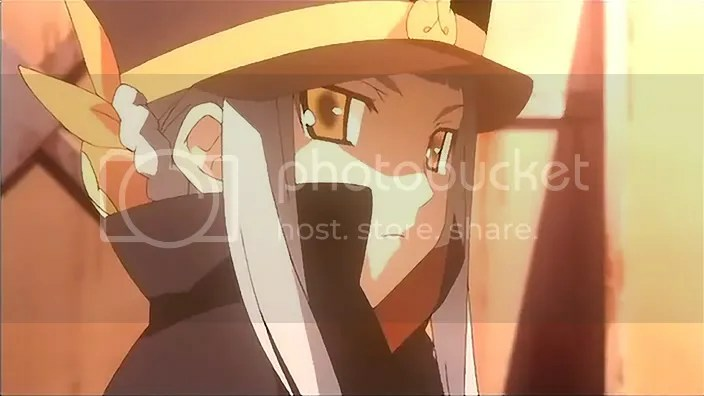 Many would say that the series is repetitive, which it is in the sense that until about halfway through the 26 epsiode series, you just watch as story after story unfold sadly like a “delicate lycoris (spider lily)”. The animation is superb and the voice acting is near dead-on perfect. Jigoku Shoujo gets a 4.5 of 5 for it’s amazing stories and it’s ability to raise awareness of how our world really is today. Hope you found this useful, at least a bit xD I’ll definitely put more up later! Thank you all so much for a wonderful year (first with a blog!!!). Overall, the year was so-so for me….pretty much equal good and bad…..nah! more good! Talking about anime, 2007 wasn’t filled with too many super-great-giantic-five-star animes, but it was filled with a heck of a lot of good ones! 2008 is gonna be chock-full of sequels, so it worries me slightly anime-wise, but we’ll just have to wait and see, ne? I’m counting on you Kyoto Animation >8D!!!! It’s been a rather – short – year. I still remember my birthday back in March like it was yesterday TT–TT Last night I was out at a party at one of my mother’s friend’s places. It was fun and I wasn’t tired at all (thankfully)!! Probably because I was addicted to these little chocolate thingy’s (not a very good description) and was eating them in a rhythmic cycle all through the night. My older sister Miyuki was at a different party, though she stayed on speaker phone with us for most of the night : ) We had fun posing for pictures with champagne and playing the Wii. Usually we don’t have much of a choice but all the kids at the place brought their Wii games so we were a bit overwhelmed with the amount of games and didn’t get to even play all of them. We watched the New Year ring in on TV in New York City as tradition states and then……….fell asleep. Well, every year I count up how many animes I have watching during that time and calculate the hours/minutes/days I have spent watching them. Isn’t it kind of sick how obsessed I am? Hey I got my whole life ahead of me….right….right!??! Hopefully soon I will have a most-anticipated anime of 2008/ Best of 2007 anime list up~! Hang in there! The numbers for 2007 are finally in…. From what I’ve heard, manga is cheap only one place in the world. Japan. The average manga, about the thickness of a telephone/address book, in Japan is only 200 yen, about 1.75 in US dollars, 290.18 in euros, and 138.3 Singapore dollars. WAAH! Whenever I hear of my cousins etc etc buying manga back in Japan for that cheap, it makes me weep. I do understand licensing is expensive and so is the translating yatta yatta (Why…why oh why can’t there be subtitles for manga? I know it’s physically impossible but don’t crush my hopes and dreams! ), but is it really that bad? That expensive? Apparently. It always seems to be a show I just watched. Like immediately after I finished Haruhi Suzumiya no Yuutsu, they came out with the dub. Right after i finished Air TV they came out with the dub. When I was done with Jigoku Shoujo I found out that a dub was coming out for it in a few months. And now…of all shows…. 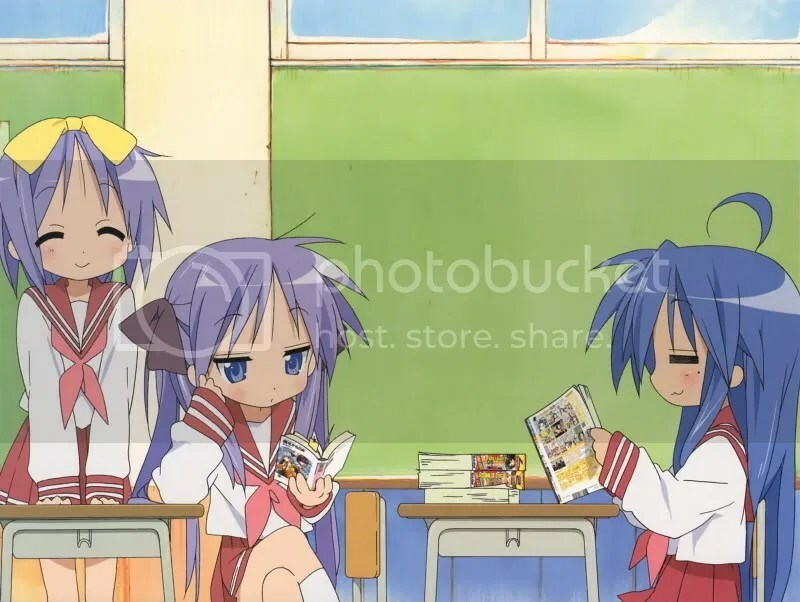 beloved Lucky Star is coming out with an English dub. What.the.heck. It probably annoys me because they pick such crappy voice actors (no offense here either). I’m so sick of the English voice actors not sounding at all like the Japanese characters or they try to imitate the Japanese seiyuus. It gets on my nerves! I mean, probably one of the best well known examples will be the recent dub of The Melancholy of Haruhi Suzumiya. That just sucked. I don’t think you can find anyone to replace Aya Hirano’s voice, let alone capture the Japanese spirit/voice in them. I usually don’t like using extreme words like hate, but this is why I really hate Funimation. I don’t hate them personally, I hate their stupid dubs. My most hated English dubbers are (remember, I hate their dubbing profession, the actual people. I am sure they are really good people in person 😀 ) Caitlin Glass, Wendee Lee (yes,yes,surprise), Michelle Ruff, and Brina Palencia. These are probably some of the most loved and known voice actresses so I know a lot of people like them, be warned. Quite frankly, each of them is trying to be a Japanese seiyuu-gone-english…which they aren’t. I’m sick of seeing Wendee Lee being cast into Aya Hirano’s roles. She sounds like..like she’s trying too hard half the time. And quite frankly, she’s way too overused. Caitlin Glass’s voice is just plain annoying to me D: I’m probably just mad because she was cast as Tsukasa xD Her voice isn’t very Tsukasa-ish. And last but definitely not least, Brina Palencia. I despise it when she is cast as Mamiko Noto’s role. She just sounds like a Mami-chan wannabe. Seriously. She sounds like she is forcefully trying to whisper. Well, now that I have that out of my system ^^ I’m cooled off about this for now…until the next horrifyingly degrading dub of another anime comes out. What do the people like?